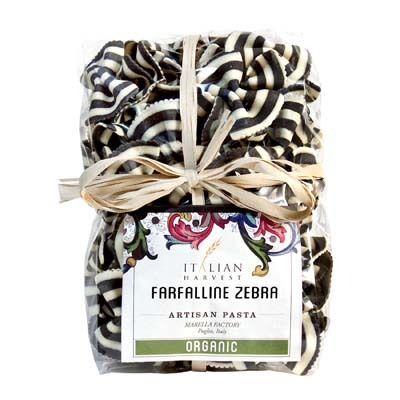 Beautifully chic and incredibly scrumptious, these Farfalline Zebra Black & White Bowties are perfect for theme parties. One of the lovely pasta creations of Marella, this pack of pretty bowties can be suitable for any festive occasion. Serve it with light creamy sauces or pesto. You can also just toss it with butter and Parmesan cheese. For a dramatic effect, you can use a classic Italian tomato sauce to add some beautiful red color to the mix. You may also use it for salads and soups. Already have tons of plans for these lovely bowtie pasta? Well then, order a bag now!